This Sunjoy Mushroom Garden Stake Set will perfectly illuminate your walkway or garden path. 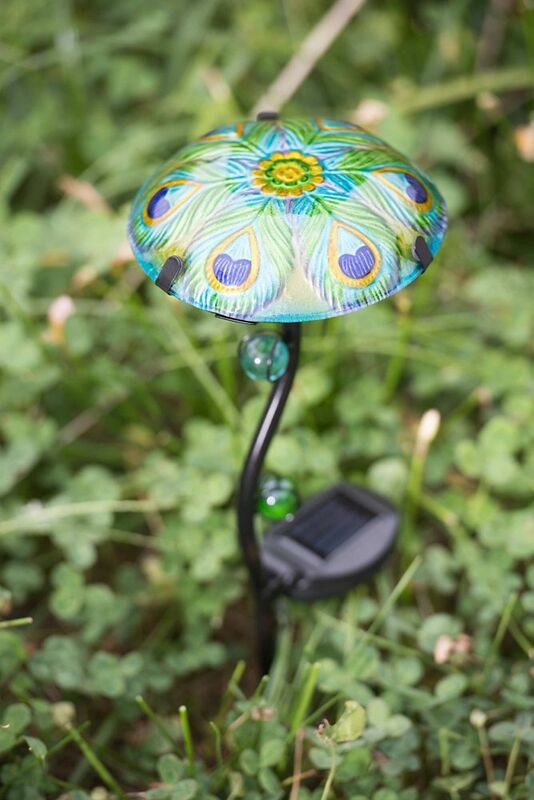 The beautifully hand-painted peacock design covering the glass mushroom caps provides a pop of color during the daylight hours and gently glows during the evening, drawing power from the LED solar panel. The sparkling green and blue glass eggs affixed to the rod add extra sparkle and visual interest. The fold up panel requires no set up. Just implant these stakes in a sunny daytime location and enjoy the benefits. Each stake stands just over 18 inches tall and is made of sturdy iron, a perfect height for placement in your flower bed. Place a series of these peacock garden stakes along your garden path or sidewalk and you will have a more alluring and enchanted walkway. The beautifully hand-painted peacock design covering the glass mushroom caps provides a pop of color during the daylight hours and gently glows during the evening, drawing power from the LED solar panel. The sparkling green and blue glass eggs affixed to the rod add extra sparkle and visual interest. The fold up panel requires no set up. Mushroom Garden Stake With Solar LED, Peacock Pattern This Sunjoy Mushroom Garden Stake Set will perfectly illuminate your walkway or garden path. The beautifully hand-painted peacock design covering the glass mushroom caps provides a pop of color during the daylight hours and gently glows during the evening, drawing power from the LED solar panel. The sparkling green and blue glass eggs affixed to the rod add extra sparkle and visual interest. The fold up panel requires no set up. Just implant these stakes in a sunny daytime location and enjoy the benefits. Each stake stands just over 18 inches tall and is made of sturdy iron, a perfect height for placement in your flower bed. Place a series of these peacock garden stakes along your garden path or sidewalk and you will have a more alluring and enchanted walkway. Mushroom Garden Stake With Solar LED, Peacock Pattern is rated 3.0 out of 5 by 2. Rated 5 out of 5 by Arleta from I can’t wait for warm weather to install the stakes... I can’t wait for warm weather to install the stakes in my flowerbed! They are just the right amount of cutesy ! Rated 1 out of 5 by nextsp from Although the mushroom part is pretty, 2 out of the 3 do not work. I have tried them in different ... Although the mushroom part is pretty, 2 out of the 3 do not work. I have tried them in different sunny spots in the yard (they are supposed to be solar-powered), but they never light up at night.